We felt like nothing else but a big ol’ carb-alicious sandwich from somewhere, anywhere after a lengthy 4-hour training. 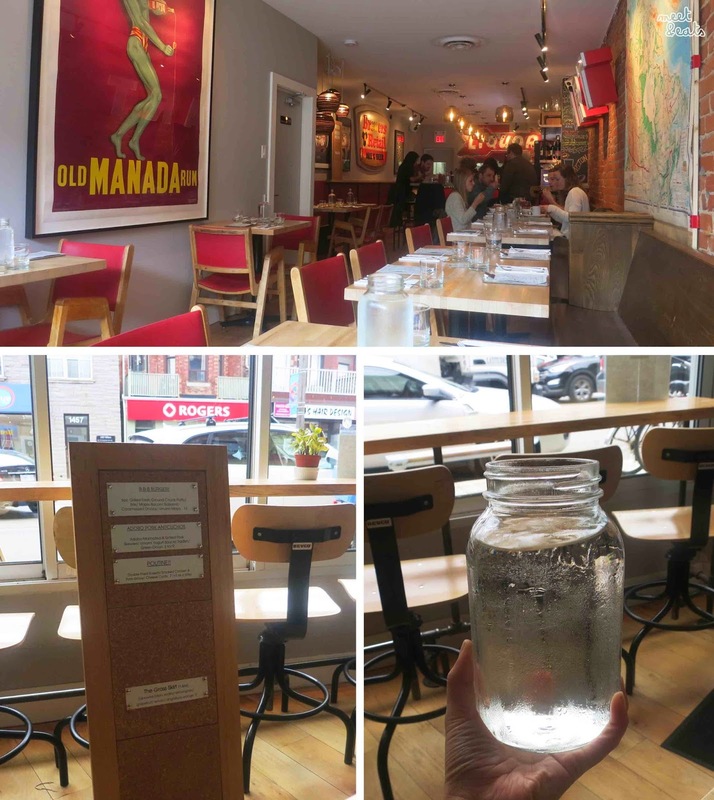 This End Up, a very hipster-esque Dundas West joint, was the right calling. We were seated and presented the specials on an oversized wooden cork pin-board… Very, very, hipster. I enjoyed the sight of the paintings, translating that they serve up local produce in their restaurant – a nice touch! Their menu was a unique one each sandwich had a twist to it – Gochuchang (Korean sauce) in a Chicken Sandwich, and slices of Pork Belly in a Beef Burger? We had to go for those. If I was here for the evening, I would have went for their drinks as well. 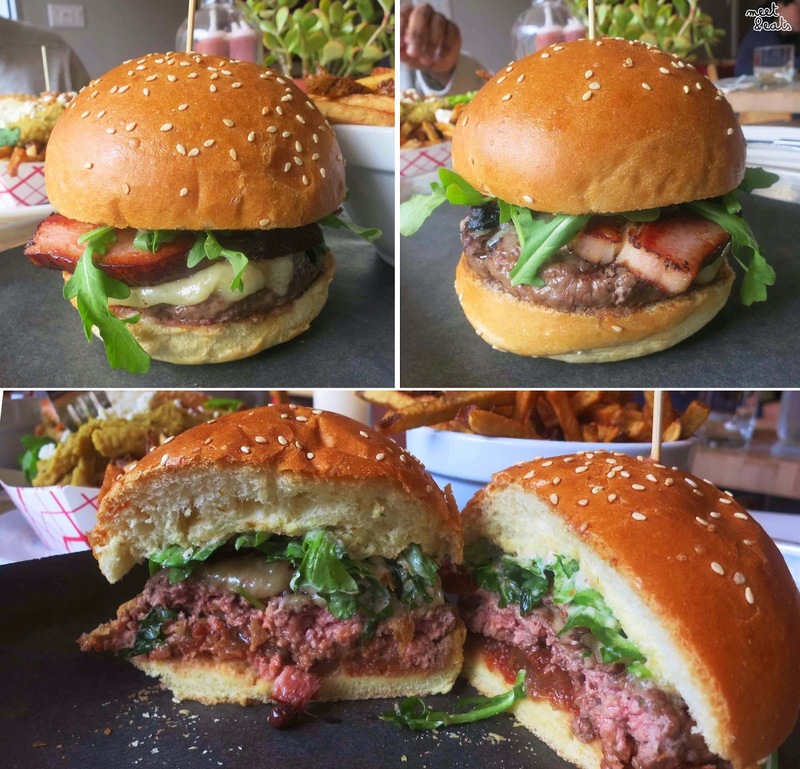 There are various Vegetarian options available here as well, the Smoked Tofu Taco (3 for $12) and Cali-Coco BLT ($13) – with Smoked “Coconut” Bacon and Havarti sounds swell! Apart from their Sandwiches, you also have options of Baja Fish Tacos (3 for $13), Wings (1lb/$13) and Kimchili Cheese Fries ($8)… What part of this menu doesn’t intrigue you??? We… Probably had way too much fries between the two of us. The Double Fried Russets were fresh out of the fryer, a crispy, addictive delight… I just wish I didn’t get so full. The Dal Frites are Fries with a plop of Dal – Dal is usually enjoyed on Rice or Bread, This End Up put a nice, innovative twist on that! It was an O.K. for me, but my friend has grown up with Dal and thought of it to be marvelous. 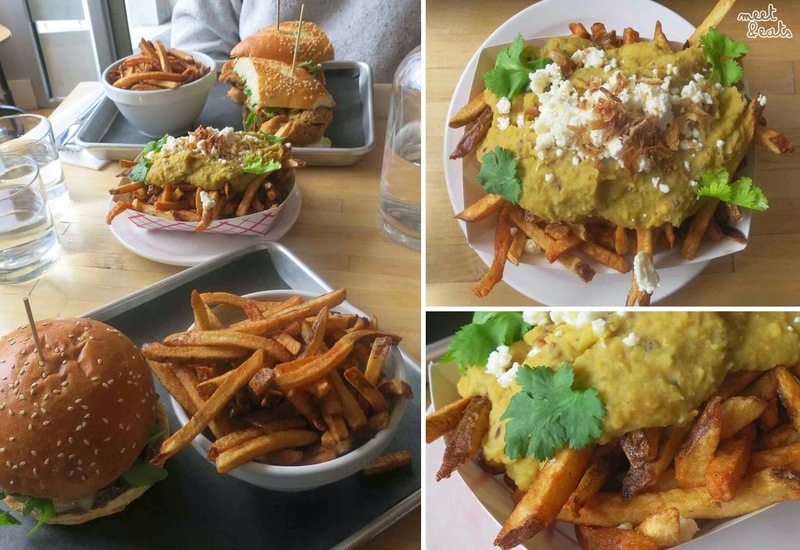 For me, it was exactly how you assume mashed Lentils with a tad of spices would be, on fries – if would have been much better if the Dal-to-Fries ratio was larger. 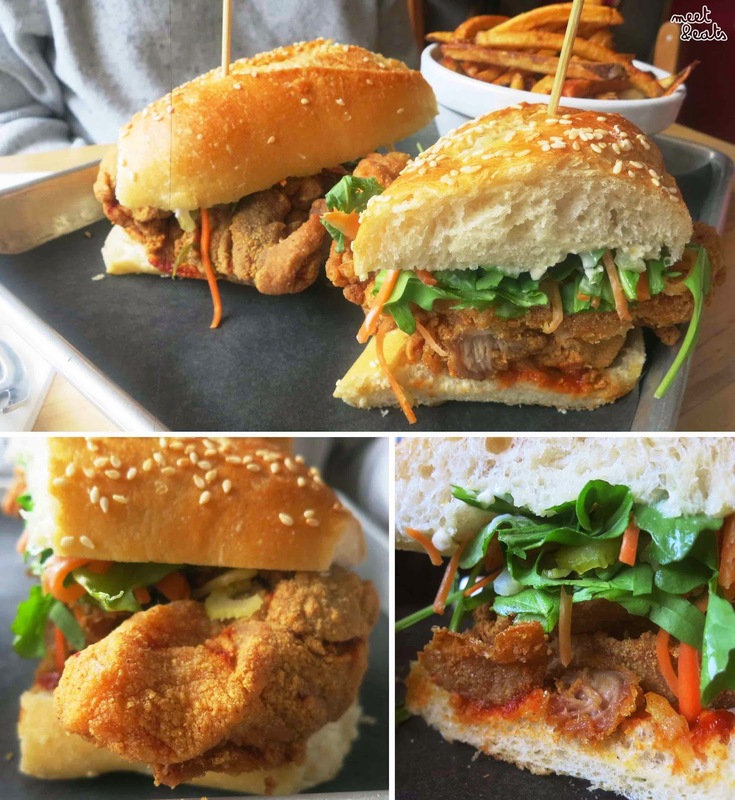 A minimum twenty minute wait – this Fried Chicken Thigh Sandwich was full of flavour, a highly recommended choice by everybody who has chowed at This End Up – the Chicken Thigh was juicy and absolutely overflows in the bun, it hardly catches it. Even though it was tasty, the bread got in the way a bit too much for me, so I didn’t find it as much of a thrill. Again, the bread was just wrong. The Beef Patty was very juicy and full of flavour, but I couldn’t enjoy it enough with such a thick and un-complimenting amount of breading. The Pork Belly was surprisingly well seasoned, but not in such a way that I found special enough to enjoy again. There are many more menu options that I’d like to explore! 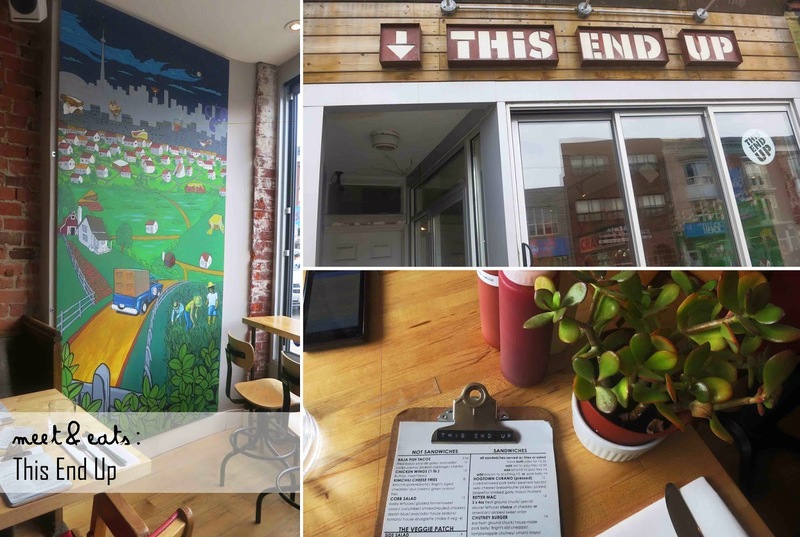 This End Up is very creative with their menu, each component seems to be well though-up of. A great place for a quick bite, I would love to try their drinks one day or another… I will be back!